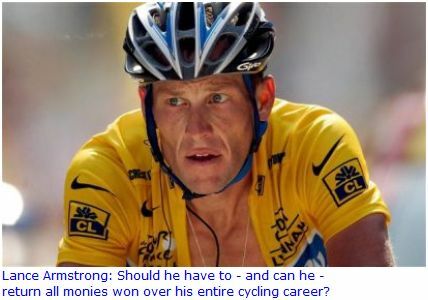 "Lance Armstrong risks losing a lot more than he thinks - and not only his seven Tour de France victories. ... Financially, he risks quickly finding himself out on the street. Because they are going to ask him for all the money he received from his Tour victories, and surely from the other races. He is going to have to repay almost all of the winnings he took in during his entire career." Professor and French anti-doping specialist Jean-Pierre de Mondenard says that after giving up his assertions of innocence, Lance Armstrong's financial problems will be formidible. “It’s his choice, his position, but Lance Armstrong risks losing a lot more than he thinks - and not only his seven Tour de France victories.” Professor and French anti-doping specialist Jean-Pierre de Mondenard, interviewed by cyclisme.actu.fr, knows that the choice of the seven-time winner of the Tour de France is a risky one. By deciding not to contest charges made by the USADA (the United States Anti-Doping Agency), which intends to strip him of his titles from the Grande Boucle and ban him from sport competitions for life, Lance Armstrong could lose a great sum of money. In fact, the American cyclist will have to repay all monies received for his victories in the Tour (€2.5 million or $3.2 million) and also bonuses (€8,000 for every stage won and €350 for every day he wore the yellow jersey, plus bonuses for the mountain passes [included in the Tour]. “Financially, he risks quickly finding himself out on the street. Because they are going to ask him for all the money he received from his Tour victories, and surely from the other races. He is going to have to repay almost all of the winnings he took in during his entire career. And don’t forget about the insurance policies and the astronomical sums of money paid to him every time he won the Tour de France. He's going to have to repay all this too, because I don't believe the insurance companies will leave him alone,” predicts Professor de Mondenard. And it wasn't only Lance Armstrong that received these earnings, because the tradition in cycling is that the winner shares his earnings with all members of his team. With this revocation, those identified as the new winners of the Tour de France from 1999 to 2005 will hit the jackpot. 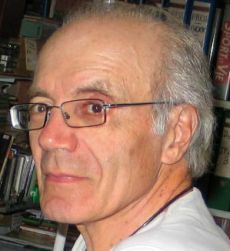 “Logically, they will receive the winning sums, but the problem is figuring out who the winner is now!,” jokes Emmanuel Potiron, journalist at cyclisme.actu.fr. The UCI, the International Cyclist Union, should be reimbursed by the American champion. This money will go toward the fight against doping. But the financial burdens for Lance Armstrong don’t stop there. He may also have to repay some of the money he earned from endorsement deals. “In more and more contracts that bind an enterprise with athletes, there are clauses about doping. If the contract is terminated, the brand could request indemnities and interest for the damage the brand suffered. If the contract remains valid, the enterprise can call for its termination or demand penalties. The sums to be repaid vary, but could amount to as much as the value of the entire contract,” details Jean-Jacques Bertrand, a Paris lawyer specializing in sports. Such proceedings could be costly to Lance Armstrong - who was one of the most sought-after athletes for sponsors, as he embodied the image of the courageous sportsman capable of defeating cancer. According to American Fox Sports Radio, his income in 2010 (the last year before he retirement from cycling) reached $20 million, $16.5 million of which came from contracts with Coca Cola, Nike, Subaru, Trek, Oakley, Anheuser-Bush, etc. According to the Sunday Times, he would have amassed a fortune of €100 million [$125 million] during his career. Today, 11 enterprises still sponsor the Lance Armstrong Foundation and its fight against cancer.